There will be an update in the mainstream segment of mobile graphics cards from Nvidia with the Geforce 920MX, 930MX und 940MX. Notebookcheck has exclusive information from an industry insider claiming that Nvidia will soon refresh its mainstream lineup of mobile GPUs. 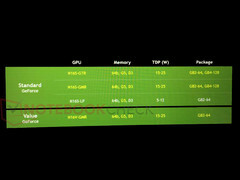 More precisely, expect successors to the current Geforce 920M, 930M and 940M, which are all used in numerous low-end to mainstream multimedia notebooks. 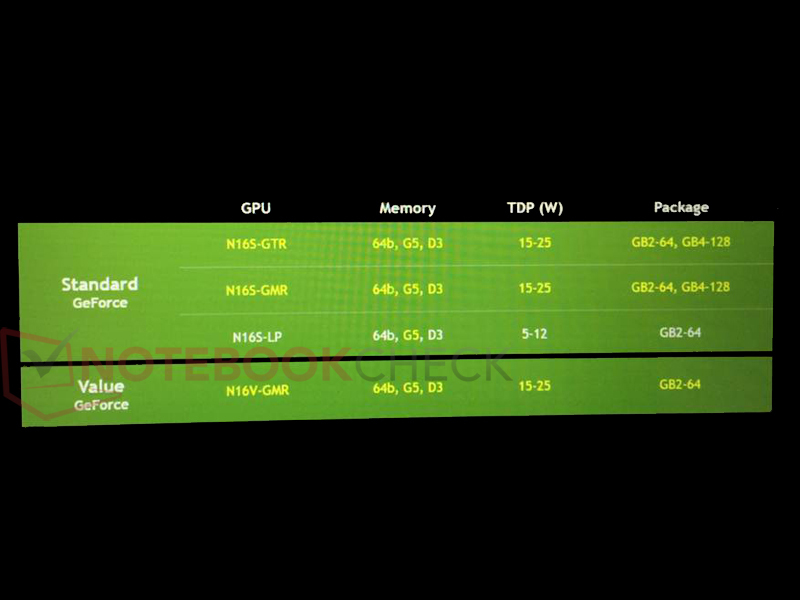 The picture we have shows three new GPUs with the code names N16V-GMR, N16S-GMR and N16S-GTR, which will be released as the GeForce 920MX, GeForce 930MX and GeForce 940MX, respectively, by early next year. According to our information, the raw specifications of the new chips should be on par with the current 920M, 930M and 940M. One new feature, however, is the (optional) support of GDDR5 VRAM. The TDP of the new chips is also similar to the current models at 15-25 Watts. Thanks to the use of GDDR5 VRAM, the performance of the GPUs can be improved significantly. If you look at the Microsoft Surface Book, for example, you can see that the GDDR5 version (1 GB) of the current Geforce 940M can be up to 20 % faster depending on the benchmark, and the advantages are even higher in some games. The mentioned N16S-LP from the picture corresponds with the current GeForce 930M in the low-power (LP) segment with a TDP of 12 Watts. This chip will be upgraded with the optional GDDR5 video memory.